Wish you could send customized Google Maps directions from your desktop to your phone—or save a map to your phone’s memory for when you’re out of wireless range? Done. Also: get a 3D view of your maps, zoom in with a single finger, and more. Double-tap the screen, and keep your fingertip pressed on the display after the second tap. Now, slide your fingertip up and down the screen; as you do, the map will zoom in and out. Another option: add “+” and “-” zoom buttons in the bottom-right corner of the screen. Tap the “overflow menu” key (the column of three dots in the bottom-right corner of the screen) and tap the Settings, Display. Go back to Maps, and you’ll see two little “+” and “-” buttons in the bottom corner of the display. Update: The method for saving an offline map via Google Maps has completely changed since this article was published. Click here for the details. The Google Maps app won’t do you much good when your Android phone doesn’t have a signal. 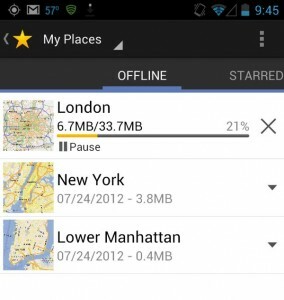 If you think ahead, though, you can have a saved, “offline” map ready for times when you know you’ll be out of network range—say, while you’re travelling abroad, or whenever you’re in an area with a weak wireless signal. 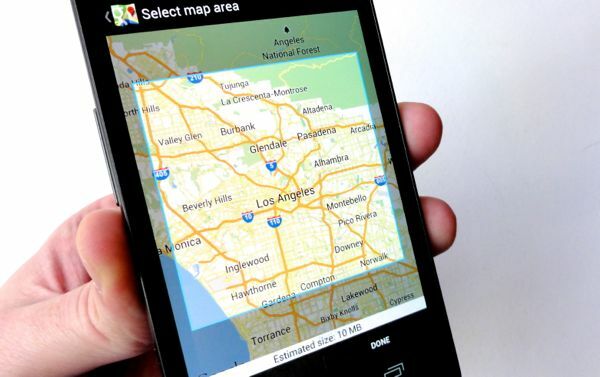 Once you save a map to your phone, you can access it from your Offline list, even without a wireless signal. The “offline” feature in Google Maps has plenty of limitations; for example, you can’t search for a place in offline mode, nor can you call up point-to-point directions. If you’re stuck in a signal-free zone, though, having an offline map saved in your phone’s memory is better than nothing. Navigate to a location, neighborhood, or even an entire city that you’d like to save to your phone. Tap the “overflow menu” button (those three little dots again), then tap the “Make Available Offline” option. Next, select an area of the map to save by fitting it into the highlighted square. At the bottom of the map, you’ll see how much space the “offline” map will take up in your phone’s memory; the bigger the map, the more storage space it will require. To access your offline maps, tap Maps in the top-left corner of the screen, select My Places, then swipe left to the Offline tab. Tap a map in the list to load it onto the screen, or tap the little downward arrow to rename or delete the map. By default, Google Maps gives you a view of your maps from directly overhead. If you like, though, you can view your maps from a slight angle for a nifty 3D perspective—an effect that’s especially striking wherever 3D outlines of buildings and skyscrapers are available. To change your Google Maps perspective, just tap and hold two fingertips on the display, then drag ’em both down at the same time. To tilt your maps back “up,” swipe up with two fingertips. Also, don’t forget that you can twirl the map by “pinching” the screen and rotating your fingertips. So, you just looked up driving directions to your summer rental using Google Maps on your PC. Wouldn’t it be nice if you could simply send the map directly to Google Maps your phone? 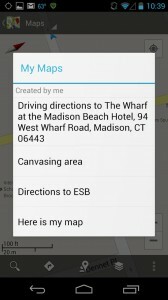 You can pull up any saved maps from Google Maps on your desktop from the My Maps menu on your Android phone. First, make sure you’re signed into your Google account on your desktop browser, search for a location on Google Maps, click its “pin,” then click the “Directions” link. Scroll to the bottom of the directions in the left-hand column of your browser, then click the “Save to My Maps” link. Next, a pull-down menu of saved maps will appear. Select “Create a new map” and click the Save button. The list of directions will disappear, and the name of your newly-saved map will appear at the top of the left-hand column. Click the red Edit button to rename the map, add a description, draw a line or add a pin (click the buttons in the top-left corner of the map). Now, open Google Maps on your Android phone, tap the “Layers” button at the bottom of the screen (it’s the icon with three small, stacked rectangles), tap My Maps, then select the map you just created on the web. Your saved map, complete with directions and any pins or lines you added, will pop up on the screen. Whenever you tap a pin, a business name, or any other “point of interest” in Google Maps, a little “bubble” with the name of the location will pop up on the screen; just tap the name to jump to a menu of information and options. Go back to that bubble, through, and you’ll see a secondary button to the left of the name. Want the “Action” button in a location bubble to pull up Street View rather than driving directions? Done. By default, that “Action” button should launch the Get Directions menu, but you can also swap it out for a few other choices, including Street View (a street-level, 360-degree panorama) and Call (which automatically dials the number of the location you tapped). Tap the “overload menu” button (yep, the three dots) in the bottom-right corner of the screen, tap Settings, then tap Display. Tap Bubble Action, then choose a new option from the menu. Go back to the map, tap a location, and you’ll see your new “Action” button in the location bubble; keep in mind, though, that the button may be grayed-out if the option you selected (such as Street View) isn’t available for the location you tapped.